For about 20 minutes, Diane Grich finds herself in a tranquil state of mind as she lies down on an examination bed at One Hundred Oaks. She knows what to expect for her second acupuncture session. Five needles in each ear may have pinched at first, but it surprisingly soothed her. "I do feel better because it relaxes you," said Grich. In what seems to be an atmosphere meant for a massage therapy, Grich is placed in a calm environment to help alleviate the pain to her lower back. She is one of two dozen patients who have received the Battlefield acupuncture treatment since it first began at Vanderbilt University Medical Center in February. "I never had acupuncture in my ears before, and it was all new to me. It was an alternative to having to take a drug," added Grich. 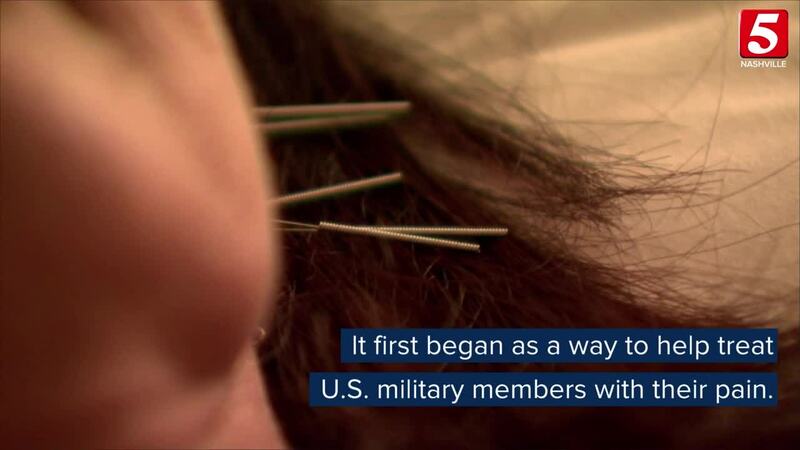 Battlefield acupuncture first began in 2001 to help treat the pain of service members with the U.S. military. The needles are smaller and easier to administer and transport. It eventually reached hospitals across the country. The treatment allowed military members to continue to do their jobs, unlike being placed under a specific medication with certain effects to the body. The ancient approach unclogs the flow of 'qi' and clears the pain as a different approach to pain management amid the opioid crisis. There are more people in the U.S. turning to acupuncture to help treat their chronic pain, according to government surveys. "If there are blockages then the thought is it's causing pain and discomfort. Those needles theoretically release those blockages and give better comfort and pain," said Heather J. Jackson, Assistant Director of Outpatient Surgery at VUMC. 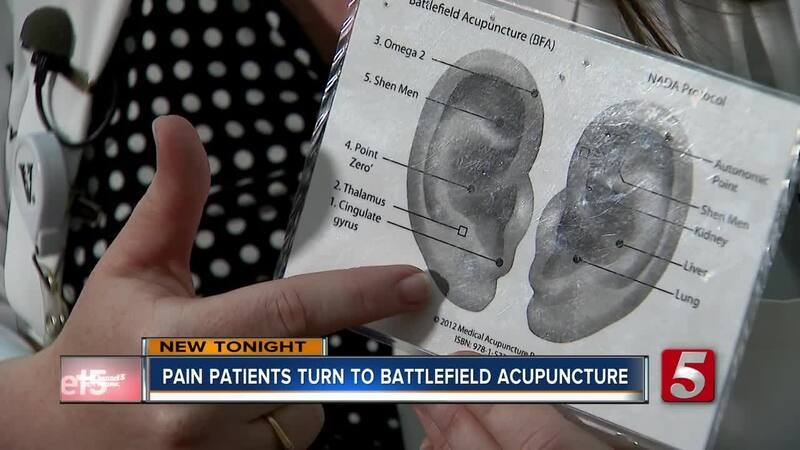 With Battlefield acupuncture, Jackson applies needles to only the ears instead of the body. While there are skeptics who question the benefits of acupuncture and the need for more research, doctors and patients agree it is doing something. "All the preliminary data on small studies says yes, it's helpful. Maybe it doesn't help in this area, but it helps in this other area, such as depression and anxiety, and everything says you need more research," added Jackson. Unlike the traditional method, Battlefield acupuncture is cheaper at 20 dollars per session. Acupuncture is not a covered benefit for TennCare members. Jackson said she is receiving more patients through word of mouth. St. Thomas Medical Partners on Old Hickory Boulevard in Brentwood also administers Battlefield acupuncture.